The website had difficulties putting the image up I mentioned, so I'll whack it on here. Basically this is how I've run in the 480 SNGs I've played in the duration of the grading. 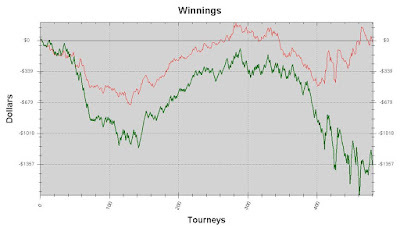 The green line is where I am, and the red line is where I would be at had my luck been average....nice! 3 Comments to "Black Belt Poker Grading: 180 degrees"
Im so tired after this week. Its been a tough, if interesting week. But obviously the end target mean everything is worth the effort imo. Unlucky about the running so far in the blackbelt challenge. Good luck with the rest of it. If you want you can link my blog up too. By the way, I sat next to you at one of the £330 deepstack at DTD this year sometime before you busted! If you got blue belt would you accept it?